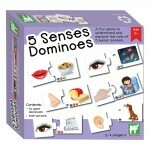 A fun game to help children understand and explore the role of the five human senses in everday life. Children classify objects according to the ways in which they relate to the human senses. Match the object to the primary sense used,eg. ear the phone. Develops understanding of parts ..
A stimulating, challenging and beautifully illustrated memory trainer senses game which stimulates and develops early sensory and language skills. 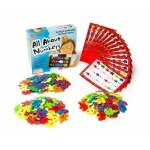 Contents include: sturdy red plastic memory trainer board, 16 blue removable covers, 20 durable, laminated picture cards, 32 small playing cards and t..
Self correcting and graded for different ability levels, explores number bonds (5+3=8, 4+4=8 etc), addition and subtraction up to 5, 10, and 20. Contents include: 300 counters of numbers, dots, words, blanks and symbols. Set of 14, laminated, self correcting camel counter numeracy cards and teach.. 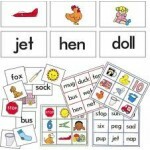 The clear illustrations will provide valuable picture clues for children who are learning to recognise common sight words. Use with small groups as a fun, fast SNAP game or as a sorting and matching activity for individual students. There are 160 laminated cards in a sturdy container complete wit.. Beat the Bear (initial consonants) is played in a similar manner to traditional Bingo. There will be lots of funBeat the Bear is played in a similar manner to traditional lotto. There will be lots of fun and excitement as the team of three children select one card at a time from the top of .. 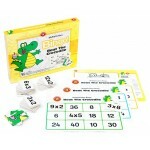 Beat the Crocodile (multiplication) Bingo is played in a similar manner to traditional Bingo. There will be lots of fun and excitement as the team of 3 children select one card at a time from the top of the deck. If a player selects a card where the multiplication fact matches to an answer on the.. 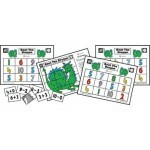 Beat the Dragon (addition & subtraction) Bingo - Who will be first to win the race to complete a mat? Will this be the team of three players or the dragon? The players will be so intent on completing their boards before the picture of the dragon is put together, that they will barely notice t.. Beat the Frog (Rhyming Words) Bingo. Simple phonetic words have been used for this delightful rhyming game. Ideal for early readers, Beat the Frog is based on 104 words from the following rhyming families: ap, at, ell,en, ing, ip, ock, op, ug. Who can complete their board first? One of the 3 play.. 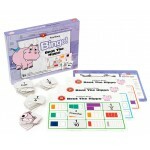 Beat the Hippo (Fractions) Bingo is played in a similar manner to traditional Bingo. There will be lots of fun and excitement as the team of three children select one card at a time from the top of the deck. If a player selects a card where the place value matches to an answer on the player'.. 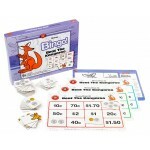 Beat the Kangaroo (australian money $) Bingo is played in a similar manner to traditional Bingo. There will be lots of fun and active learning as the team of three children select one card at a time from the top of the deck. If a player picks up a card tha.. Beat the Octopus (colour and shape) Bingo Beat The Octopus (colour and shape recognition) is played in a similar manner to traditional bingo. Who will be first to win the race to complete a board? Will this be the team of three players or the octopus? The players will be so intent on co.. 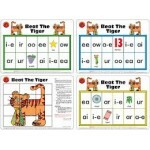 Beat the Tiger is played in a similar manner to traditional Bingo. There will be lots of fun and excitement as the team of 3 children select one card at a time from the top of the deck. If a player picks up a card that matches a common double sound on his/her board, it may be placed in the c..
An inspiring and interactive educational board game that introduces children to the wonder of the humble bee. 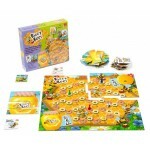 Includes game board, 4 counters, 24 numbered picture cards, 4 honey pots, die and instruction sheet. Suitable for ages 3 - 6+ and 2 - 4 players. Explores the vital role bees pla..
Blending Consonants Desk Games (Box of 3) This box set includes 3 desk games teaching the blending ofl consonants. 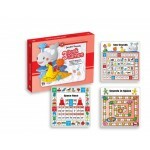 The games are Sounds Ahoy, Rabbit Race and Racing with Blends. Learning outcomes: working with instructions, mastering sounds and building vocabulary. Contents include 3.. The illustrations and words used in this set of twenty six cards have been carefully selected to provide a phonetically correct representation for each of the following initial and final blends: bl, cl, fl, gl, pl, sl, br, cr, dr, fr, gr, pr, tr, sc, sk, sn, sp, st, sw, tw, and, ck, ing, le, II, .. 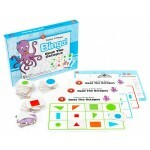 Play Snap , Fish or Concentration or use as a matching activity. Contains 160 laminated cards and instructions for use. Supplied in a sturdy plastic container. 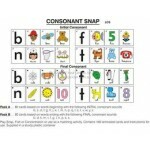 Pack A contains 80 INITIAL CONSONANT sounds. Pack B contains 80 FINAL CONSONANT sounds. .. 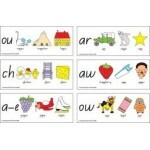 This set of colourful cards has been designed for young readers who are learning the more difficult "sound combinations" including vowel and consonant digraphs, long vowels and double sounds. Each of the 26 plastic-coated cards measures 345mm x 143mm. Visually appealing to children, this set of c.. 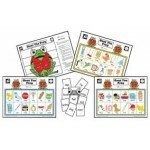 Double Sounds Desk Games (box of 3) This box set includes 3 desk games teaching initial consonants. The games are Sea Sounds, Space Race and Sounds In Space. Learning outcomes: working with instructions, mastering sounds and building vocabulary. Contents include 3 durable wipe clean mats ..
Easy Words to Sound Bingo is ideal for children who are learning that single sounds can be blended together to form simple 3 or 4 letter phonetic words. The game is self-correcting and can be played without adult supervision by 3-9 children. All cards are laminated and printed on both sides. 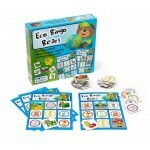 This..
A fun bingo game where Eco Bear teaches children to reduce, reuse, recycle. Ideal for encouraging children to be more eco aware and put into practice tips picked up along the way! Eco Bear be aware! Teaching about the recycling of glass, metal, plastic, paper and food waste. Explaining and demons..